Republican presidential nominee Mitt Romney on Thursday at the Republican National Convention in Tampa. Among the things the Republican Party's presidential candidate is hearing this morning about the address he gave Thursday night is that "in a speech heavy on anecdotal history but short on policy details, Mitt Romney avoided major falsehoods." -- PolitiFact.com is giving Romney its "pants on fire" rating for saying that President Obama began his term in office with "an apology tour." According to PolitiFact, "a review of Obama's foreign travels and remarks during his early presidency showed no evidence to support such a blunt and disparaging claim." It has flagged Romney for that "apology tour" claim before, as have other fact checkers. -- Romney said "let me make this very clear unlike President Obama, I will not raise taxes on the middle class." The Associated Press writes that, "Obama has enacted several laws that could raise taxes for some middle-class families. Other Obama laws, however, have reduced taxes for many more such families." -- President Obama, according to Romney, has cut $716 billion from Medicare that will "both hurt today's seniors, and depress innovation." But The Washington Post's Fact Checker says "the savings mostly are wrung from health-care providers, not Medicare beneficiaries — who, as a result of the health-care law, ended up with new benefits for preventive care and prescription drugs." Romney's Medicare comment is another one that's been called false before. -- FactCheck.org, while saying Romney avoided major falsehoods, does say: "We found a few bits of exaggeration and puffery. He exaggerated the loss in family income that has occurred under Obama, for example, including 13 months of losses that actually occurred before the president took office. And he made a back-handed accusation that Obama has raised taxes on middle-class taxpayers, when in fact the president has lobbied for and signed several temporary reductions." "In a June 2008 speech marking his victory in the Democratic primaries, Obama said generations from now, 'we will be able to look back and tell our children that ... this was the moment when the rise of the oceans began to slow and our planet began to heal.' 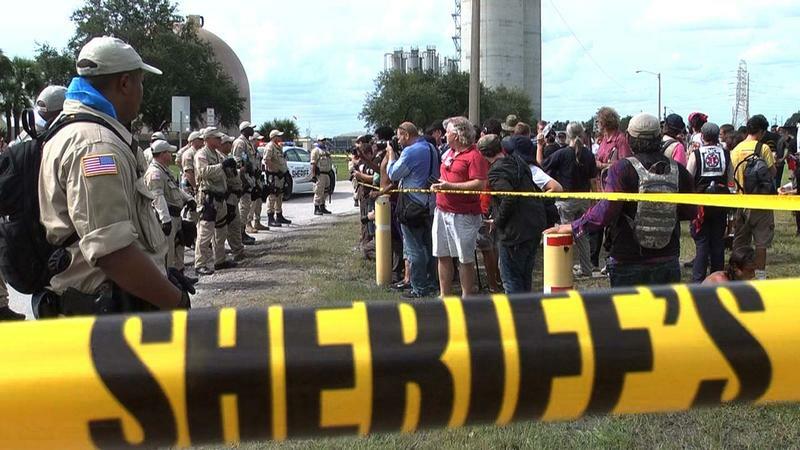 "
No arrests were made, although operations at TECO's Big Bend Power Plant in Apollo Beach were interrupted for a few hours Thursday due to a Republican National Convention-related protest. Five protesters chained themselves together in the middle of a road at the plant, while a sixth chained himself to a truck.